Kachori or Kachauri or Kachodi or Katchuri is a spicy snack popular in various parts of India.Small, crisp, golden puri, stuffed with a dry, spiced filling is how I’d describe a Kachori that has its origins in Rajasthan,India. But we are in KUWAIT, and to find authentic Indian snacks is little difficult. When we first arrived in Kuwait, we often used to go to Thakkar restaurant (Read for more details) situated at Salmiya. But after the birth of our daughter it was not possible to visit so often as Salmiya is far from where we stay. Our problem was solved when Gokul Restaurant was opened at Abu Halifa(Read for more details). They serve authentic Indian snacks and I am their regular customer. 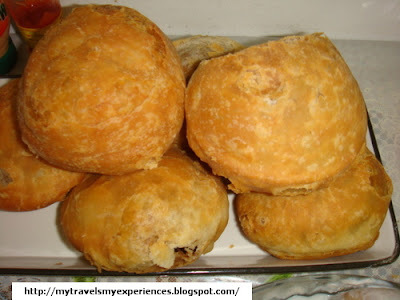 I very often order Kachori from them and I have found no restaurants in Kuwait, who serves more tasty Kachori then Them. You can order Kachori(.100fils each), Dahi Kachori(.300Fils each) and Raj Kachori(.400fils each).